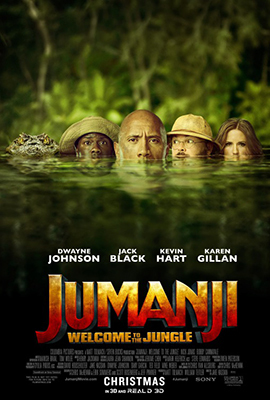 Synopsis: Four teenagers are sucked into Jumanji's world - pitted against rhinos, black mambas and an endless variety of jungle traps and puzzles. To survive, they'll play as characters from the game: meek Spencer becomes a stupid and girl crazy jock (Johnson); football jock Fridge becomes a tiny Einstein (Hart); It-girl Bethany becomes a bookworm professor (Black); and unathletic Martha becomes an amazonian warrior (Gillan). To beat the game and return to the Planet Earth with their lives, they'll have to start seeing things in an entirely different way.